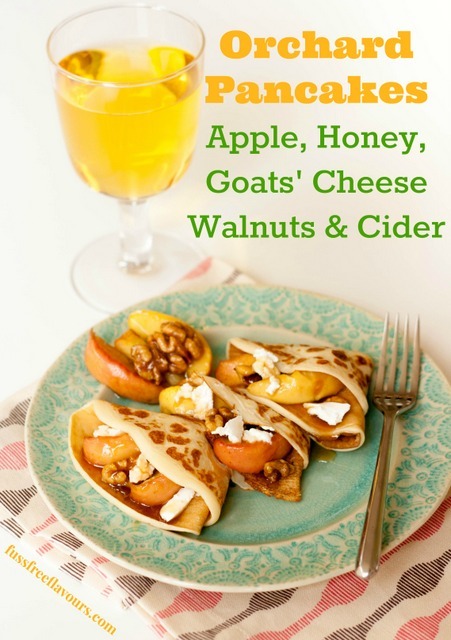 Flip a basic pancake recipe around by adding some cider to your orchard pancakes and serve with caramalised apples, goats’ cheese and walnuts. I seem to have spent the entirety of last week flipping! Not flipping in the getting cross type of way, but literally flipping. Pancake after pancake after pancake as I’ve been developing recipes and completing a few last minute commissions. The seasonal life of a food blogger or writer can be somewhat out of sync due to the fact that content for monthly print magazines needs to be completed several months in advance. During the heat of July it feels strange and slightly surreal to walk into various winter wonderlands as I attend all the Christmas press shows, it really seems the wrong time of year to think about Christmas, but is also really rather fun! I love the spring press shows in the cold dark depths of winter and their promise that better weather is coming soon. There is somewhat more leeway for internet publishing, but when you are tucking into your pancakes on Tuesday it is a fairly safe bet that we will be eating something else – Easter will roll around soon enough and I already have a supply of mini eggs and some plans for baking! For those of you who will be eating pancakes on Tuesday, Asda have a very handy pancake mix-o-meter to help you gauge quantities – simply enter the number of people and how many pancakes they will eat and it will calculate a recipe for you to make exactly the right amount of batter. My recommendation is to allow a few more pancakes than you think that you will need, invariably the first one out of the pan is never very good, and even the most restrained person can become quite; dare I say, greedy with their yearly pancake feast. For some more pancake facts check out this fun infographic from ASDA. We are huge fans of savoury pancakes, and I’ve flipped a basic recipe around a bit for these Orchard inspired pancakes, adding cider to the batter, in place of half of the milk. It lightens them and adds a subtle apple flavour, I am sure that most of the alcohol will evaporate when cooking, but if making these for children use a low alcohol cider, or dry apple juice. Looking for a savoury pancake instead? Check out my Pancake Pizzas! If you try this Orchard Pancakes – Cider, Apple, Goats’ Cheese & Walnut please tag #FussFreeFlavours on Instagram or Twitter. It is amazing for me when for me when you make one of my recipes and I really do love to see them. You can also share it on my Facebook page. Please pin this recipe to Pinterest too! Thanks for reading Fuss Free Flavours! Melt the butter and honey together in a small frying pan, add the apple and walnuts gently cook on a medium heat for 10 minutes until the apples are golden and the sauce has reduced and is thick and sticky. Reduce the heat to keep them warm whilst you make the pancakes. Mix together the flour, eggs, and the milk. Add the cider or apple juice and whisk until the mix is smooth and the consistency of thin cream. Heat a little of the butter in a large non stick frying pan over a medium heat, and pour in about half a ladle of the pancake batter. Tilt the pan gently swirling the batter to spread it out, and return to the heat. Cook for about 45 seconds to a minute until golden and solid, and either flip with a spatula or fish slice or toss. Cook the other side for 30 seconds or so until done. 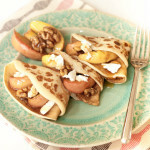 Serve the pancakes filled with the apple and walnuts, a drizzle of the sauce and a dab of the goats’ cheese.